Maybe we could get a mod for some Rayman inspired races? I looked outside my fence today. My neighbors are behaving strangely. Time to head back inside. On a more serious note, I am running into a couple of issue. One issue is that finger bones seem to be missing for females. The other is that some parts are getting culled when the camera gets close (probably a bounding box issue). Any thoughts on the fingers? This is looking nice, should make it much easier to know where stuff is in the world. I mean the white boxes work to an extent, but not nearly as well as seeing actual characters. I suggest you to open a pull request, if you are looking for help. It will allow other developers to test this feature and maybe track down these issues. I'll open a PR with what I got. I just haven't had the time to focus on this for the past week or so. When I left off, I discovered that female hands have bones that male hands don't... My code is largely based off of what is in the game engine. I'll be looking into how the engine initializes osg/resource loaders to see if something is happening there. Take a look at animation.cpp and npcanimation.cpp. In these files we handle NPC bodyparts. IIRC, we do not handle every finger separately - we handle whole "Left Hand" and "Right Hand" bones. That is strange. IIRC, fingers 3 and 4 are only used in first-person meshes (and animations) and by some creatures. Basic NPC skeletons have only fingers 0-2. So you try to load 1st-person hands for females. It seems you are right. Currently OpenMW treats NPC as vampire, if he has an ability with ESM::MagicEffect::Vampirism magic effect. Morrowind adds such ability ("vampire sun damage") manually via AddSpell console command. 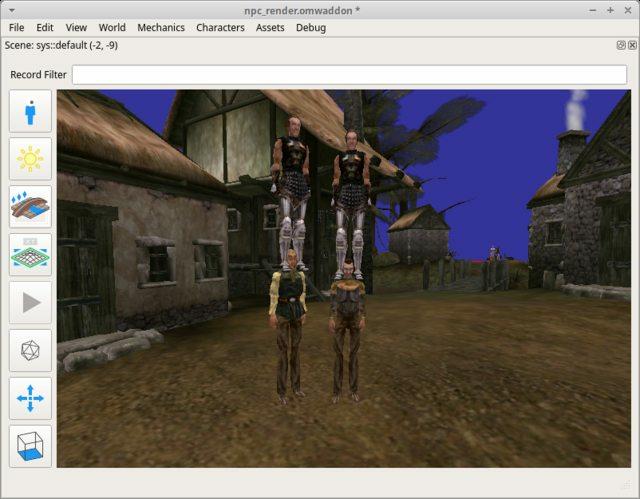 TES CS renders NPCs as vampires only because developers manually assigned vampire heads to them. Lycanthropy is handled via BecomeWereWolf/UndoWereWolf console commands, so I doubt that we can do anything here. 1. NPC's with a spell named 'Vampirism' will be rendered as vampires (this excludes effects added in scripts because that would be overly complicated). 2. NPC's with 'Sanies Lupinus' (aka werewolf blood) will not be rendered as werewolves. If any modders think this should be done differently, let me know. I plan to have the functionality to display werewolves implemented, but without any way to view them... though perhaps they could be rendered when the lighting is changed to night? though perhaps they could be rendered when the lighting is changed to night? Haha. That would be a pretty fun and kind of intuitive feature. What are those guards doing! Made some progress recently. There's quite a bit more to this feature than I first thought. In any case, I will be cleaning up my changes so far and update my MR. After that, it will be a couple weeks before I can work on this again. I'll be finishing up my internship and travelling back to my university. During that time, if someone want to pick this up, feel free to do so.